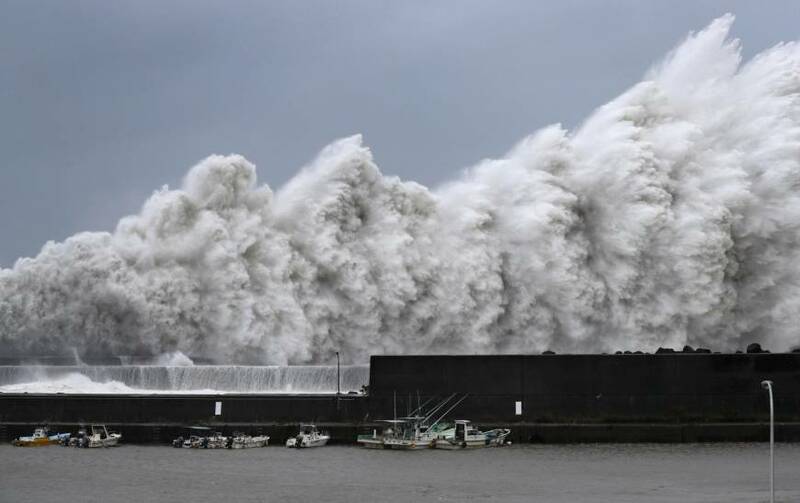 Japan advised more than a million people to evacuate their homes Tuesday and canceled hundreds of flights as the west coast was hit with high winds and heavy rain in what was described as the worst typhoon in 25 years. Typhoon Jebi, whose name means swallow in Korean, is the latest spate of record-breaking, deadly weather patterns to hit the island nation this summer, after historic floods, landslides, and a heat wave killed at least 300 people. The heatwave in Japan this summer was part of a pattern of hotter weather in several parts of the world that scientists have blamed on a warming planet. Kyodo News said Jebi was the strongest typhoon to make landfall since 1993, while NHK public television said tides in some areas were the highest since a typhoon in 1961. Strong winds brought down a company’s storage facility in Shiga Prefecture, killing one man and another died in Osaka after being blown from his apartment, according to local media. The typhoon first made landfall on the island of Shikoku, where wind gusts of up to 129 mph were recorded. Around 3.9 inches of rain drenched one part of the tourist city of Kyoto in an hour, the Associated Press reported, with as much as 20 inches set to fall in some areas in the 24 hours to noon on Wednesday. More than 700 flights were canceled, according to Japanese media, while the Shinkansen bullet train services between Tokyo and Hiroshima was also suspended. In Osaka, the Universal Studios Japan amusement park and U.S. Consulate were both closed, agencies reported. The airport, which is built on an artificial island, had one of its runways flooded along with a terminal building. A tanker collision with the bridge led to the airport then caused it to close down entirely. More than 175,000 people lost power in western Japan, according to the Ministry of Economy, Trade and Industry said, while more than a million people were advised to leave their homes by the Fire and Disaster Management Agency said.